Also, be sure to fuel up with healthy offerings from the Dilworth Park Café. Spring Training is presented by Rothman Institute with partners Optimal Sport Health Clubs and City Fit Girls. 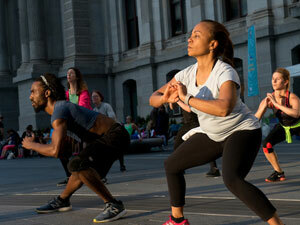 Visit DilworthPark.org/springtraining/ for schedules and fitness tips. On April 18, 5-7pm, dress to impress and join Nicole Miller at the Bellevue for "Wear With Denim," an exclusive shopping event featuring their new spring 2018 denim collection. Plus, a live DJ will be on hand, with informal modeling, cocktails and hors d'oeuvres. Ten percent of sales that night will be donated to the Philadelphia Bar Foundation. To RSVP, email nmunoz@nicolemillerphiladelphia.com. From April 20-28, the Philadelphia Science Festival educates, inspires, and engages the region with the science and technology that surrounds our everyday world. Established in 2011 by The Franklin Institute, the Philadelphia Science Festival is a nine-day celebration of science and technology in everyday places—parks, restaurants, bars, libraries, and museums. It offers more than 80 events all across the region, ranging from kid-friendly live science events, themed bar crawls and cocktail hours, self-guided tours, creative workshops, stargazing parties and more— most of which are free of charge. The Festival’s grand finale is the free daylong Science Carnival on the Benjamin Franklin Parkway, April 28. The massive outdoor science carnival is a packed day of non-stop family-friendly activities, hands-on experiments, live performances, educator opportunities, and explosive visuals.